There are many different methods that can be used to install roofing materials and accessories. The Sketches and descriptions of various Roofing Installations depicted on these web pages are tried and true methods that will greatly reduce the chance of leaks and other roofing problems. The web pages listed below are for Roofing Professionals and anyone else with more than just a passing interest in roofing. These web pages include roofing installation tips, sketches, photos, and roof installation procedures to aid the roofing industry in better roof installations. The sketches are very useful as a training tool. 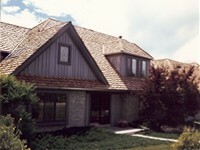 They are a step-by-step guide of how to properly install roofing materials and accessories. The installation drawings show step-by-step details for the proper installation methods of underlayments, flashing, and setting the skylight. There have always been problems with the flashing details at Head Walls, Rake Walls, and Chimneys especially if brick or stone veneer is used. The roof to be replaced is on a townhome and has a slope on the same plane as another unit's roof that is not being replaced. The neighbor does not want any work to be performed on his portion of the roof slope. What can you do? This web page contains Eave Roofing Material Installation sketches detailing what common materials are used and where they are installed for most all Steep-Sloped roofing. This web page illustrates the proper flashing techniques for Eave to Rake Wall Flashing. This web page illustrates the proper installation of Tile roofing materials and accessories at Tile Eave to Rake Wall Intersections.